Hamish’s ill health brought home, to both Hamish and Richard that it was past the time for him to retire from the active stretcher production team. Hamish deserves a more restful time and will now just give the production team his advice when it is needed. When he started the new mould, Richard’s plans never anticipated that he would have to make all the fittings as well. Only when he was faced with taking over Hamish’s side of the production did Richard realise how much effort Hamish had been putting into finishing the stretcher tubs sent to him. Taking on the component manufacturing presented both a challenge and an opportunity. Replacing most of the Mk7’s metal fittings with designs that can be produced from advanced composite material will make the Mk8 stretcher both lighter and stronger. The problem was that one cannot just change the material. The switch to composites has required a complete redesign of every fitting, starting from a stress analysis and a decision on the most suitable production method and construction materials. Now every new component will require a number of machined moulds for their production. The switch to composites has forced Richard to fundamentally rethink the way the Mk7’s components worked. Armed with the experience gained from the Mk7 and the properties of the advanced composite material, many of the fittings have been total redesigned. The end result will be a greatly improved stretcher but inevitably this work has extended the development time. Driven by his determination to produce the best stretcher that he can make, Richard has survived for two and a half years without any income. Despite having invested the equity he raised by selling his house, his resources are now very stretched. The benefits to the rescue teams from the new MacInnes Mk8 rescue stretcher will make the sacrifice well worthwhile, but Richard now does need help if he is to continue and finish this development project. “We all benefit from the efforts of our emergency and rescue teams. Those of us who love to experience the wild and remote places of this world will sadly need their assistance more often than most. These teams are called out in the worst of weathers and risk their lives to transport casualties to safety over extremely difficult terrain. It is therefore incumbent on us to ensure that their task is made easier by having the best of equipment. Acutely aware of the rescue team’s needs, the climber Hamish MacInnes has for many years dedicated himself to improving the equipment available to the mostly volunteer rescue teams. He asked for my help and our collaboration saw the birth of the MacInnes Mk7 folding rescue stretcher. While the Mk7 has proved itself, the switch to composite construction was made late in the design process and the full benefits of the new construction were not then realised. Determined to do better, I have for more than two years worked full time on developing a new MacInnes Mk8 stretcher. Perfecting this new design has become something of an obsession for me. Setting up for the new production is now well advanced, but sadly I do not have the financial resources needed to finish this development without help. This is why I am making this appeal for your assistance. If you or someone you love enjoys adventure sports of any kind, please help me to complete the development and testing of this new MacInnes Mk 8 rescue stretcher. This new folding stretcher will be lighter, stronger and even tougher than the Mk7 model. I believe that because of its design and cutting edge composite construction, it will be by far the best stretcher available to the rescue teams. 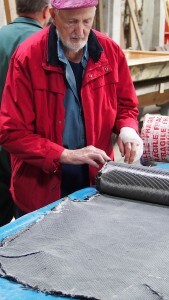 I will also be continuing with further development and testing of new composite materials. We at MacInnes Stretchers will always have a policy of continual development. We are determined to ensure that our stretchers remain the best that the teams can get. Hamish MacInnes also supports this appeal for help and will send all who donate to this cause a signed letter of thanks. If you wish to make a donation, you can do so using either credit or debit cards, via the secure donation button below. We use Paypal for this as they do all the relevant checks to ensure your money is safe and we are all protected by the money laundering laws in our respective countries. If you would prefer, you can send your donation directly to the “MacInnes Stretchers” account but please pop us an email so that we can send you the details. MacInnes Stretchers want all potential donors to understand that they will not receive any financial or material reward in return for their donation. We will do our best to ensure that the donors reward will be the satisfaction of knowing they have helped us to provide the rescue teams with the best stretchers we can make. No prizes or other material rewards will be given to donors, apart from Hamish’s letter of thanks. As our thanks to all the donors, we will collect their names and ask Hamish MacInnes to draw one name at random, in the presence of members of the Glen Coe Rescue Team. This donor will be asked to nominate a rescue team or other charity of their choice. We will also ask them for a name, either their own or someone else that they wish to be remembered in this way. MacInnes Stretchers will attach this name to a new MacInnes Mk8 rescue stretcher and will donate it to the chosen team or charity.